Complaining online against such wrongful act(s)by abhorrent caseworker at DCFS,DCF doesn't get you anywhere,but where you're "used of in life being dealing with vile cps worker." When a social worker has intentionally;and or recklessly cause harm to you,and knowingly engage in such wrongful act(s)unbecoming to a state employee et.al., up to you to commence the execution of your civil right suit PRO-SE. Ext. 815 #DEADLINE do exist throughout. Don't miss your chance to seek accountability against CPS. Many are winning when suing with or without a lawyer known as (pro per...or pro-se)self file lawsuits against caseworkers are growing." 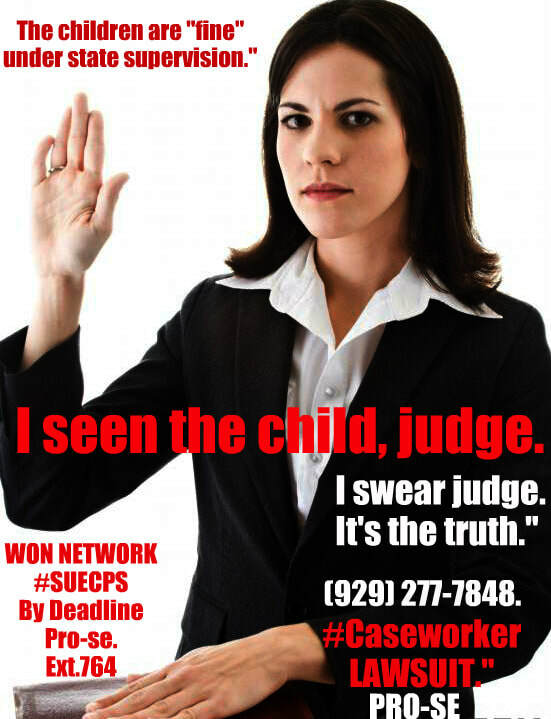 Up to you to say ENOUGH and execute your lawsuit for damages against CPS. Now,the owner of the nation's 1st effective learning network of its kind,is focus on 1 day, implementing LAW SCHOOL,after her brutal ordeal against abhorrent DCF." A loving mother,innocent,lost her rights, as an American, to her own child, courtesy of DCFS in California. She sued. Held those accountable. She won,proving you're able to naturally sue CPS employee,and or the COUNTY directly for such money damages, associated with the loss of a child,civil rights violation et.al., and we pray for the parent, falsely accused, (Ms.Kemper) at our well-recognized student ACTION #winning network over at W.O.N.E-lawstudent expertise research consulting specialist. Click here, as such form must be submitted to our very busy #EFFECTIVE 1-on-1 network,prior to call being connected. When attorneys are not caring enough to sue for you, knowing DEADLINE is near per day you're still NOT suing abhorrent DCF, up to you to NOT procrastinate and execute it timely, pro-se. Like us on FACEBOOK(SUE CPS by deadline in federal court, Pro-se) at anytime, and "click here or on contact us page on our popular FB page)to begin, prior to calling in.